Every naturally formed Emerald is unique in both in colour and its internal pattern and structure. These distinctive characteristics make this precious May Birthstone both instantly recognisable and mean that every Emerald is different, special and completely individual. These are just two of the reasons we adore Emeralds and the unique factor to each stone makes a perfect starting point for creating special, bespoke statement jewellery with a truly personal touch. Solid Yellow Gold handmade ring with Cabochon cut Emerald gemstone surrounded by a Halo of Diamonds. But how can a single Emerald have such a unique and even to the untrained eye, instantly recognisable features? Emerald is formed in metamorphic rocks when violent geological events occur which brings together beryllium, chromium and vanadium (these last two elements are responsible for the Emerald’s distinctive shade of green) which then form this stunning gemstone. This natural and dramatic formation is integral to the very distinctive nature of each and every emerald as it often causes the stones to become marked with a “beauty spot”, technically known as an inclusion or minute fissure. These individual inclusions can be highly prized and add value to a stone and are known amongst Gemstone Experts as “Jardin” (the French for garden.) Inclusions are indeed such a known characteristic of natural Emeralds that to find a perfect and unflawed stone is probably a good indication it is synthetic and made in a laboratory. Ancient Egypt is the home of the earliest known emerald mines as this stone was revered by Pharaoh’s and famously adored by Cleopatra. Emerald was an inspiration for the Medieval alchemists, enriching the creation of the Tabula Smaragdina; an Emerald tablet which is connected to the origin of the Philosopher’s stone, with carefully engraved written contents that include theories on the creation of the world and the creation between microcosm and macrocosm. In Medieval times, Christians connected the beautiful emerald to Lucifer, the devil, claiming this gemstone had come from Lucifer’s own crown. Nero, the Roman emperor, was said to watch Gladiator matches through a Beryl (Emerald is part of the Beryl stone family) which if true could be the first known invention of sunglasses! Aztecs named the emerald; Stone of the Earth. It was associated with fertility and celebrated their belief by creating beautiful Emerald statues to honour this belief. 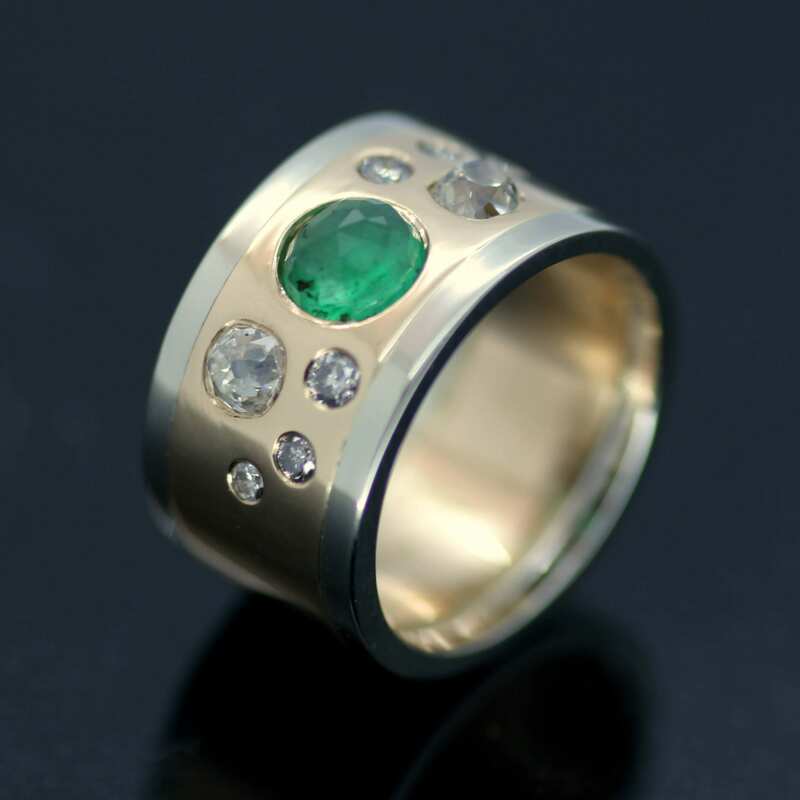 Emerald gemstones often feature heavily in Julian Stephen’s bespoke work and the stunning example below features a lovely Emerald gemstone as its centrepiece. 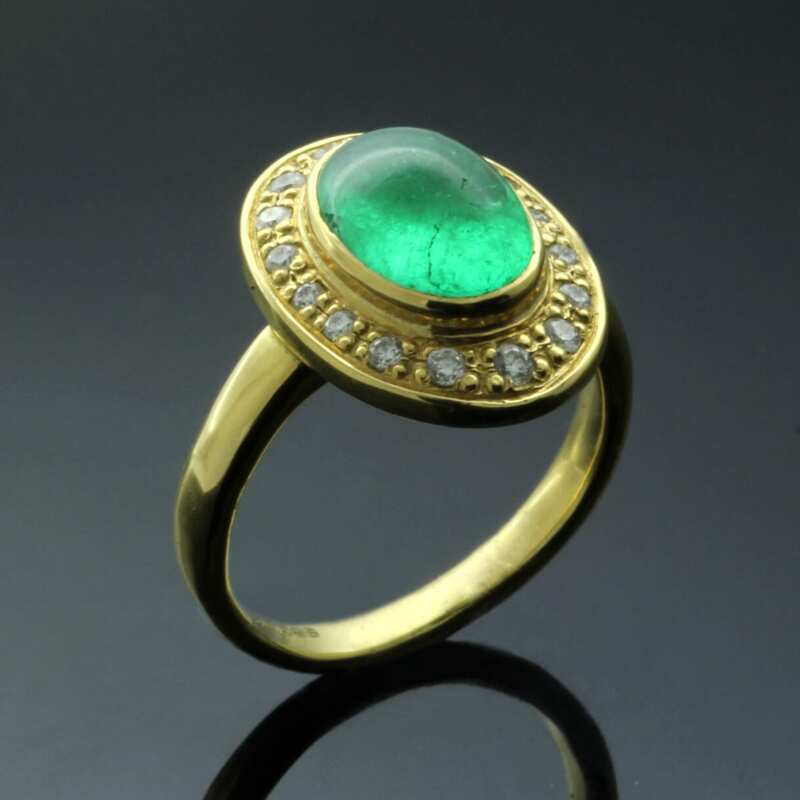 Although Julian uses Emeralds occasionally in his own unique Jewellery Designs he often works with inherited vintage and Antique Emeralds, supplied by our wonderful clients as part of our bespoke Jewellery services. A stunning example of Julian Stephens bespoke jewellery design services featuring a ring commission remodelling an existing piece into an exciting fresh modern design. The very lovely example captured in the beautiful image above showcases Julian’s bespoke creations, this fine example was inspired by a customer who had an inherited an Emerald and Diamond ring which was of a style and era that didn’t suit her modern wardrobe, lifestyle or tastes. Julian sat with the client and sketched out very contemporary designs which would use the materials found in the ring, resetting stones, melting the original Platinum and 18ct Yellow Gold which is then combined with virgin Sterling Silver to produce a very modern, fresh new design that out client adored and now wears daily. If this tale of refined, fine up-cycling has inspired you to re-imagine old and unloved treasures sitting in a jewellery box then please get in contact with us to kick-start a wonderful creative journey, taking precious inherited treasures to be converted into something modern, vibrant and made just for you!